These are my contributions to the upcoming "Visions of an Icon" art exhibition, which is a celebration my very favourite super-hero - Superman, put on by the Joe Shuster Awards. 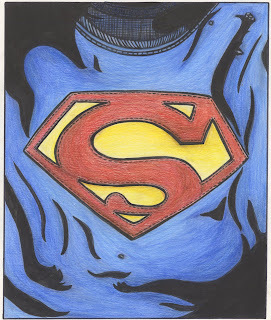 I did two drawings, the first is of the most iconic part of Supes - the crest: The image is of the suit itself, all battered up after a lot of long, hard use. After doing this piece I realized I did it in the entirely wrong dimensions (sorry guys! ), so I thought I'd better do another one for the show. Also I was anxious to draw the big guy. Inspired by Gary's Frank's recent run on Action Comics, where his rendition of Supes is heavily inspired by Chris Reeve, I did this full-on drawing. I'm quite pleased with it. 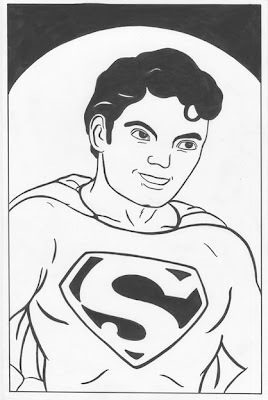 He kind of looks like Chris Reeve and also of Superboy from the old 1960's comics which I love. I don't think I've ever seen you do superheroes before! I like your Superman! Any chance we'll see you do something approximating an adventure book one day? Well, I'm doing a spy/espionage type book now... For superhero stuff, I can't see doing too much unless it was in the "Bizarro Comics" vein. I really like doing Supes though, so many I'll do a few more just for myself and post them here!